Precious objects made of silver and/or its alloys tarnish and become black when exposed to ambient atmospheres containing moisture and ppb-amounts of H2S. Such objects usually contain small but variable amounts of copper as alloying constituent and this affects the corrosion process due to a preferential oxidation of copper. However the visual appearance of the formed tarnishing layers on different types of silver alloys is very similar. Therefore, conservators-restorers are confronted with the problem that in some cases certain cleaning techniques are very effective while in other similar cases the removal of tarnishing layers is unsatisfactory. Since cleaning experiments are not allowed on genuine objects, many investigations use artificially corroded dummies instead. In order to evaluate the representativity and reproducibility of this often used methodology, differences in morphology, microstructure and composition of the sulfide layers on sterling silver generated by different sulfidation methods were analysed. Sterling silver samples were artificially aged in five different environments. The samples exposed to uncontrolled ambient air at different locations (e.g. residential and laboratory environments) showed different corrosion rates and corrosion colours. Three accelerated ageing methods were executed in a gaseous or liquid environment under controlled conditions. These tests showed different results in morphology, microstructure, composition, thickness and the interface between bulk and corrosion layer. A first accelerated sulfidation procedure in a Na2S solution alternated with exposure to air, resulted in a fast corrosion rate and an even corrosion layer formation with several S-species. A second series of sulfidation in a controlled gas environment of H2S and SO2 developed a thin but uneven corrosion layer, mainly consisting of oxides. A third corrosion methodology used was based on the thioacetamide method. This resulted in an even and relative thick corrosion layer, comparable to the Na2S/aeration sulfidation system. However, the interface between the corrosion layer and the bulk is importantly different, showing severe voids. 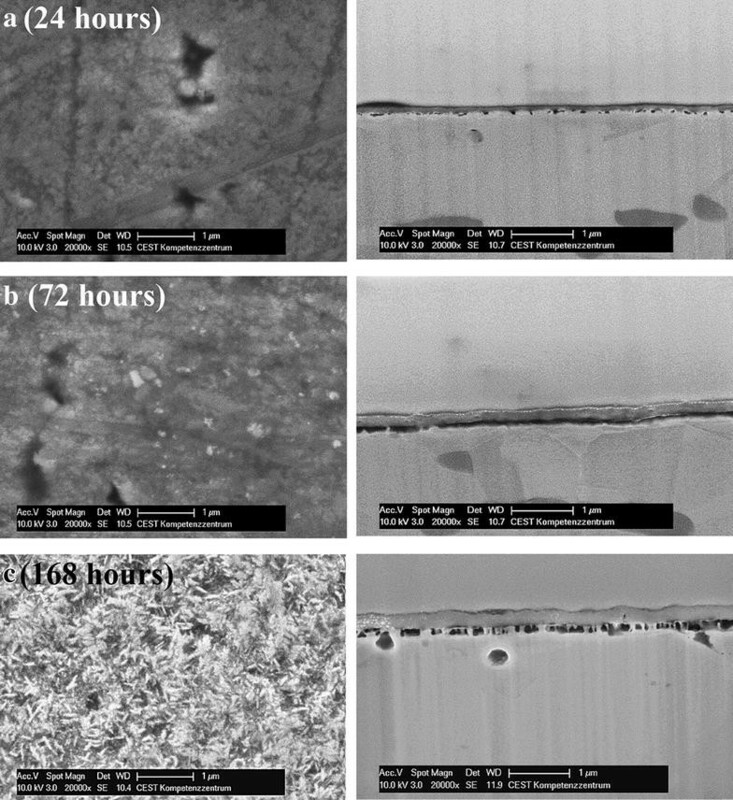 The corrosion layers generated by five different experimental sulfidation series on identical prepared sterling silver coupons were clearly different from each other. Analyses demonstrated that the composition and microstructure of the corrosion layers were strongly dependent on the sulfidation method used and copper was found to be an important element present in all sulfide layers analysed. Therefore, artificially corroded sterling silver is not necessarily representative for naturally tarnished historical objects and the extrapolation of the cleaning results obtained on dummies to historical objects must be performed with care. Many historic silver objects are not made of pure silver but rather of silver alloyed with small but variable amounts of copper. For example, a typical alloy used in jewellery is sterling silver (Ag: 92.5 w%; Cu: 7.5 w%), which consists of an Ag-rich matrix containing Cu-rich inclusions. 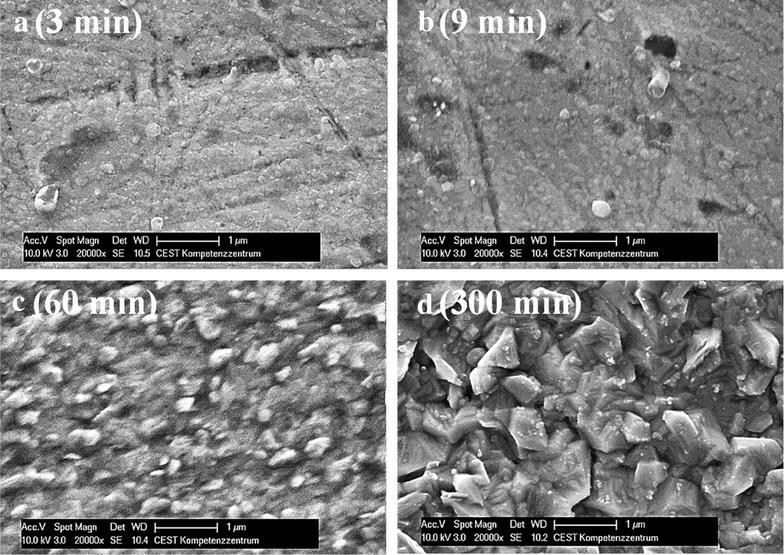 It is well known that small amounts of Cu play a crucial role in the corrosion process of silver alloys due to the preferential oxidation of Cu . As a result of this, the composition, microstructure and physical properties of tarnish layers formed on top of pure silver is substantially different from the ones formed on silver alloys, although all advanced forms of tarnish layers have a very similar visual appearance: black and dull. Unsatisfactory cleaning performances It is known that electrolytic techniques , laser  or low temperature atmospheric plasma afterglow cleaning techniques [4, 5] exhibit certain difficulties on the removal of sulfide films on sterling silver contrary to pure silver on which the corrosion products can easily be reduced. Unpredictable future corrosion When using a new cleaning technique; it is not possible to predict the future behavior of the surface without performing chemical analysis or without extensive practical experience. In order to solve the problems described in the list above, cleaning experiments are needed. However, the Venice Charter of 1964 clearly states in article 10 that experimental techniques can only be used when the efficacy has been shown and proven by experience  or the ECCO Guidelines in article 9 that ‘The Conservator-Restorer shall strive to use only products, materials and procedures which, according to the current level of knowledge, will not harm the cultural heritage, the environment or people. The action itself and the materials used should not interfere, if at all possible, with any future examination, treatment or analysis. They should also be compatible with the materials of the cultural heritage and be as easily and completely reversible as possible’ . For this purpose, cleaning experiments are usually performed on artificially sulfidized silver or sterling silver coupons. According to literature rather extreme corrosion conditions were used to generate sulfidized coupons which were considered by the authors as an imitation of the natural corrosion of silver such as immersing silver in hot aqueous solution of 0.1 M CuCl2, hot (50–60°C) Na2S·xH2O 2.5 g/l or low concentration H2S vapours (10 ppm) for 7 days [8, 9]. This suggests that some authors assume that the underlying corrosion mechanism for artificial corrosion is identical to the natural corrosion process and that the only difference would be the speed at which the process takes place. However, artificially tarnished dummies are not necessarily representative for natural tarnishing layers: (1) morphology, microstructure and composition of the corrosion layer might be dependent on the corrosion method used, and (2) there is no reason to assume that natural tarnishing layers can be described as a single corrosion state and the presence of a set of natural corrosion states must not be excluded. Moreover, objects may have different microstructures and copper distribution at the surface, may have underwent different use and storage conditions leading to a variation of corrosion layers, etc. [8–10]. The work presented here focuses on the influence of different tarnishing procedures to the obtained surface states on identical polished sterling silver coupons. The results and the knowledge gained from of this study will be beneficial for the testing of new cleaning techniques, for the understanding of the results obtained by certain cleaning techniques, and for the development of proper mitigation actions to reduce future corrosion. The numerous analyses conducted over decades about corrosion rate, underlying mechanisms and the subsequently formed corrosion products, demonstrate that the corrosion process of silver alloys is affected by several parameters such as temperature, moist content, concentration of H2S [11–28]. Compared to pure silver, alloys have several additional properties (e.g. silver-rich and copper-rich phases, grain boundaries precipitation) that affect the corrosion process from the very first steps in the making of an object. For example, production methods such as casting, hammering, coinage, rolling or annealing have a considerable impact on the distribution of copper rich phases in the bulk and at the surface and influence the corrosion process [1, 8, 29]. Another parameter that must be emphasized is the finishing procedures which has been applied during alloy manufacture such as silvering, copper depletion, burnishing as a polishing technique, etc. [1, 29–31]. Such procedures had the intention to generate a silver-rich top layer just beneath the surface. Therefore, the copper content at the surface of a silver object does not always have a direct relation to the copper amount of the bulk. As an example, pickling is a well-known technique where the previously heated and oxidized object is immersed in a hot sulfuric acid solution in order to dissolve the formed oxide-products at the surface. After the pickling, the silver rich surface is burnished to obtain a surface with high gloss. In the use of the object, along with the wear and tear, it also has to be remembered that repeated cleaning alters the surface finish and removes also possible earlier formed copper corrosion products from the surface, since Cu-inclusions corrode preferentially. This results in a silver-rich top layer. However, extensive cleaning can also again remove this silver-rich layer. Therefore, the presence of silver-rich top layers or the amount of Cu-particles in a top layer can hardly be predicted on various objects. For this research, in order to obtain a set of coupons with a very similar microstructure and copper distribution at the surface, all samples were cut from the same plate and polished in such a way that the surface state can be considered nearly identical to each other. Sterling silver sheets with a composition of Ag: 92.5 w%; Cu: 7.5 w% and dimensions of 100 mm × 200 mm × 1.0 mm were purchased at Schöne Metals Corporation. Smaller coupons with a surface area of 20 mm × 50 mm were cut from a single sheet using a parallel metal cutting guillotine. In order to standardize the corrosion tests and to study the influence of copper rich inclusions at the surface, the top layer of the sterling silver coupons was grinded and polished before weathering. Polishing steps were performed with a soft cotton rotating wheel (1,850 rpm, radius of the wheel was 60 mm) with 3 M Finesse-IT water soluble liquid polishing paste followed by 3 M Imperial lapping water soluble liquid. Each polishing step took about 1 min. This method complies with historical abrasive polishing techniques. The cleaning of the polished surface was performed according to NBN EN ISO 8891:2000 by immersing the coupon in an ultrasonic bath with ethanol for 2 min. Afterwards, the coupons are rinsed with deionised water and dried with oil- and water-free compressed air. The visual appearance of the surface is very similar to that of silver objects, finished with a traditional mechanical and abrasive polishing technique as described in technical handbooks [32, 33]. Freshly polished sterling silver coupons were exposed to five different sulfidation environments. The most important features and differences between these procedures are summarized in Table 1. According to the visual change of the surface appearance, it is possible to rank the sulfidation methods from slow to fast (indicated in Table 1). Method 1 A series of polished sterling silver coupons was exposed to an ambient atmospheric indoor environment at a private residence just outside the historical center of Antwerp (Belgium) with successive prolonged exposure times for each coupon. The average indoor conditions were 17–22°C and 40–60% relative humidity. Method 2 A similar experiment as in method 1 was performed in a chemical laboratory environment in the historical center of Antwerp (Belgium) with average conditions of 22°C ± 2 and 35–70% RH. The laboratory is fitted with a continuous ventilation system without filtration. For both methods 1 and 2, H2S concentration in indoor situations ranges from 86 to 600 ppt , which is below the detection limits of most sensors. Therefore, these values could not be recorded and the corrosion conditions must be considered as (partially) unknown. Method 3 A series of samples were exposed to a H2S containing environment following the NBN EN ISO 4538:1995 thioacetamide (TAA) procedure: a saturated Na2SO4 solution in the desiccator generated a constant relative humidity at 91% while the TAA powder distributed across the horizontal plate in de recipient slowly decomposes to H2S due to presence of moist. Three coupons were sulfidized with exposure times of 24, 72 and 168 h respectively. Method 4 In this method, a single sample was exposed in a gas tight weathering chamber to a well-defined atmosphere. A gas mixing unit provided the corrosive atmosphere, where synthetic air is mixed with any amount of relative humidity (0–95% RH) and acidifying gas (H2S, SO2) to simulate real world atmospheric corrosion conditions [34, 35]. In this method, a polished Ag925 coupon was exposed to a controlled gaseous atmosphere consisting of synthetic air, 90% RH, 500 ppb H2S and 500 ppb SO2. For the first 24 h of weathering the samples were exposed to 90% RH and 500 ppb H2S followed by 90% RH and 500 ppb SO2 for another 48 h, leading to a total weathering time in sulfur containing environment of 72 h.
Method 5 A series of polished sterling silver coupons were corroded by immersion in a 0.1 mol/L Na2S solution, combined with aeration following the norm NBN EN ISO 8891:2000. More specific, every cycle of 1 min consisted of an immersion of 12 s followed by an aeration of 48 s. The number of cycles needed to obtain a black tarnish layer was set to 60 (i.e., 60 min). The surfaces of the untreated and treated coupons were characterized using a multi-analytical approach. UV–vis spectra were collected with an Avantes spectrophotometer consisting of an AvaLight-DH-S-Bal light source combining a halogen-tungsten lamp for IR and visible light and a deuterium lamp for UV-light and the Avaspec-2048 spectrometer. Light source and detectors were coupled to a 50 mm integrating AvaSphere using fibre-optic cables. The surface was illuminated with an angle of incidence of 8°, while the partially reflected light was measured at 90°. This instrument was also used to determine the surface colour from a zone of 10 mm diameter by measuring the L*a*b*-values. The Avasoft software allows selecting a D65 illuminant and a CIE standard observer of 2° in order to calculate the L*a*b*-values from the collected UV–Vis spectrum. Colour variations were evaluated by calculating ΔE = [(ΔL*)2 + (Δa*)2 + (Δb*)2]1/2. Measurements were taken as a function of time, except for method 4 since this is not possible with the specific experimental setup. A SEM-EDX FEI Quanta 250 was used for the measurements on the samples of methods 1 and 2. The instrument is equipped with an Everhart–Thornley secondary and backscattered electron detector and an Oxford EDX detector (for semi-quantitative element analytics). For methods 3, 4 and 5, a Focused Ion Beam (FEI Quanta 200 3D) equipped with detectors for secondary and back scattered electrons and an EDX detector was used to obtain cross sections of the thin corrosion layers applying Ga-ions for the bombardment. The obtained FIB crater size was approximately 30 × 10 µm. For surface topography images (secondary electron detection), elemental distribution images (backscattered electron detection) and cross-section analyses SEM-EDX measurements were performed applying a Philips XL 30 ESEM-FEG equipped with a detectors for secondary electrons, backscattered electrons, a large field detector for secondary electron measurements in low vacuum conditions, an electron backscatter diffraction (EBSD) detector (soft. OIMDC 5.1 fa. EDAX) and an energy dispersive X-ray detector. Ag925 coupons were exposed to two different uncontrolled indoor environments (method 1 and 2) for 6 months. Colour measurements were performed every month to track the change over time. During exposure in residential environment (method 1), visual changes could hardly be observed, while exposure of the coupons in laboratory environment (method 2), lead to a visually brownish tarnish layer which gradually darkened over time. For every coupon the colour after exposure was compared with the colour just after polishing by L*a*b* measurements. This change in colour is shown in the scatter plot in Figure 1a. For the residential conditions, the colour change was considerably smaller (ΔE < 5) than for the laboratory environment (ΔE > 15). Moreover, the colour changes much faster in laboratory environment. As shown in Figure 1b, the residential series show a more bluish, while colour appearance of the series in laboratory environment exposed samples is more reddish discolouration. This difference in colour was observed as well the early and the more advanced stages in the corrosion process. Calculated colour change of Ag925 coupons exposed to residential and laboratory environments in comparison with a freshly polished Ag925 coupon. a Change in colour (ΔE) over time; b the colour as described by a* and b* values, indicating a more yellow (Residence environment) and a more reddish corrosion colour development (Laboratory environment); values with numbers 1–6 correspond to the exposure time in months as in a. Figure 2 shows SEM images of surface corrosion features formed after 6 months of exposure. The sample from the residential environment (Figure 2a) shows developed corrosion grains with submicron dimensions (0.1–0.8 µm), whilst the sample from the laboratory environment (Figure 2b) shows much larger grains (up to 3.0 µm). Corrosion on the samples after 6 months of exposure; a residential environment, b Laboratory environment. (Images AXES, Antwerp). Since the air quality and conditions are different for the two locations and cannot be considered as constant over time, this tarnishing technique is considered as examples for natural corroded objects. Therefore, the sulfide layers obtained are hard to be reproduced in an accurate way. This is illustrated by the difference in colour, colour evolution (Figure 1), morphology of the sulfide layer (Figure 2), the difference in oxygen in the spectra (Figure 3). In addition, the spectra suggest that the surface endured a copper enrichment during corrosion, that oxygen is present but that sulfide compounds are not yet developed. Such copper enrichment has been observed by others as well [1, 29, 36, 37]. It seems that the natural corrosion process traverses intermediate states. This suggests that a set of different natural corrosion states must be considered. Besides the fact that this method is probably only representative for an early stage of natural corrosion, the time needed to generate dummies this way is considered too long to be practical. EDX spectra collected on the general area of the presented images (Figure 2) show in both cases no S but an enrichment in Cu and O, moderate in the residential environment (Cu 9.6, O 1.2, S 0.1 and Ag 89.1 wt%), but strong in the laboratory environment (Cu 20.8, O 15.7, N 2.5, S 0.1 and Ag 60.9 wt%). Reference values for a non-exposed sample is Cu 5.3 and Ag 94.6; O, N and S: 0.0 wt%). A summarizing table is given at the end of the ‘Results’ part. The visual appearance of a silver coupon exposed to the H2S environment using the TAA procedure for 1 week turned into a grey and matt surface state. Visually, it is close to that of the coupons exposed for 5 months in the residence environment, described in the previous paragraph. As shown in Figure 4b, the change in colour over time did not show a clear trend. In contrast to the results obtained by the natural corrosion process (method 1 and 2), where the surface colour follows a subsequent change, here the grey coloured surface state is achieved within 24 h of weathering. Change in colour relative to the polished metal as a function of exposure time. From the obtained visual appearance, no information about the chemical and physical evolution of the sulfide layer can be stated. Therefore, SEM analyses of the surface and of FIB cross sections have been performed. The secondary electron images of the surface and the FIB cuts in the surface in Figure 5 illustrate the complexity of the bulk, the interface and the surface of the sulfidized sample. The black arrows in Figure 5a show the presence of 3 different phases. The layered structure analyzed is as follows: (1) A bulk silver with copper inclusions (Cu-rich inclusion at arrow 1 and Ag-rich matrix at arrow 3 in Figure 5a), (2) a porous interface between bulk metal and sulfide layer and (3) a compact sulfide corrosion layer (arrow 2) with a thickness of about 0.3 µm. The spherical voids seen in Figure 5a and b (at the black arrows) must be due to the preferential corrosion of copper  but in a later stage the amount of voids at the interface is so substantial that it cannot be explained by solely corrosion of copper. Apparently, the corrosion of the Ag-rich matrix goes along with Ag-migration. Also clearly visible is the filament consisting interface which must result in a rather poor adhesion of the surface corrosion film to the bulk metal. Since the formation of voids at the interface appears to continue, the adhesion of the sulfide layer to the bulk is gradually lost. Indeed, at prolonged sulfidation it is known that the tarnish layer starts to peel off . Figure 5b shows the cross section at a higher magnification where the presence of smaller light coloured grains in the sulfide layer become visible. The presence of such grains in the sulfide layer might be caused by the applied analysis method and therefore has to be interpreted with care . The amount of voids at the interface has to be considered during the evaluation of a cleaning procedure. SEM–FIB investigations of an Ag925 coupon after an exposure of 168 h according to method 3. In these FIB-cross-sectioned samples, the bulk metal is located at the bottom of the image and the sulfide layer is located between the bulk metal and the platinum evaporated on top of the surface. a the FIB cut showing different phases in arrows 1 and 3 in the metal (bottom of the image) and the sulfide layer (arrow 2); b high magnification image showing a compact sulfide layer with brighter inclusions. (Images CEST, Wr.Neustadt). 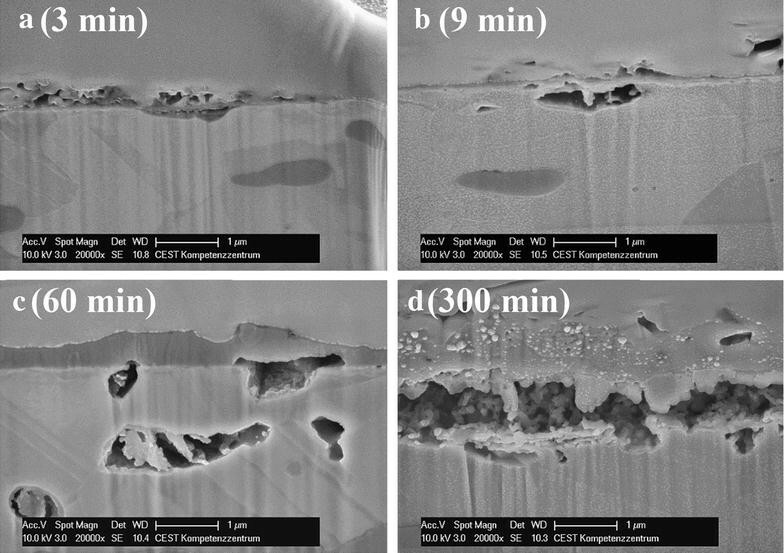 Figure 6 shows SEM images of surface corrosion features formed during the TAA corrosion process over time. The morphology of these features clearly changes from rough flaky to a finely needle shaped surface  with increasing exposure time. A solid state transition is probably occurring. Although the surfaces appear to have different extents of roughness, the corrosion layers all appear to be compact films in the FIB-cross-section. With increasing exposure time, the amount of voids at the interface increases, leading to a filament interface structure. Method 3 is a normalized procedure, performed under well controlled conditions and therefore enables the surface state to evolve from one state to another at well controllable rates. The variations shown in Figure 4 might influence the cleaning evaluation and therefore, it is recommended to perform the tests on a set of dummies corroded in the same environment and the same exposure time. Secondary electron images of the tarnishing/corrosion layer obtained by method 3 (TAA procedure), illustrating the change in morphology on the surface, left column. The right column shows the corresponding FIB-cross sections, showing the increase in voids at the interface. (Images CEST, Wr. Neustadt). X-ray spectra taken at the surface of the sample after 168 h of sulfidation shows a very large increase of Cu concentration to 30.9 wt%; O 2.7 wt%; S 12.7 wt%; rest Ag 53.1 wt% (Table 2). This shows that Cu-rich sulfide compounds are formed besides Ag-rich sulfide compounds. The presence of sulfur makes this method different from the natural corrosion methods 1 and 2. Here a corrosion process is executed under well controlled laboratory conditions (synthetic air, 90% RH, 500 ppb H2S and 500 ppb SO2) but using higher pollutant concentrations compared to most normal ambient air circumstances (c. 1 ppb). The calculated ΔE value after 72 h of weathering was 18.9. Figure 7a and b show the obtained SEM results from an Ag925 coupon exposed for 72 h to the above mentioned atmosphere. Visible is the formation of agglomerated corrosion product islands which seem to be on top of a uniform crystalline corrosion layer. Figure 7b indicates at arrows 1, 2 the EDX spectra values for the corroded surface, giving average results of Cu 11.1 wt%, O 14.4 wt%, S 0.4 wt% and Ag 73.8wt%. Arrows 3 and 4 indicate the EDX spectra for the agglomerated corrosion products, showing average results of, Cu 35.4 wt%, O 39.1 wt%, S 0.0 wt% and Ag 25.6 wt% (Table 2). This means that mainly Cu oxides are formed. Also this method suggests that in the early stages of corrosion the formation of oxides dominates the formation of sulfides. Secondary electron images of the surface of polished sterling silver after exposure to synthetic air, 90% RH and 500 ppb H2S for 24 h, followed by 90% RH and 500 ppb SO2 for another 48 h (Images CEST, Wr.Neustadt). Figure 8 shows the FIB cross sections of the weathered Ag925 coupon at different magnifications. By this approach, a sulfide layer with an irregular thickness and with a maximum of 0.15 µm thickness was formed. Visible is the formation of agglomerated corrosion product islands which seem to be on top of the corrosion layer. Energy-dispersive measurements at the spots indicated in Figure 8b revealed that the bulk metal consists of Ag (analyzing spot 2) with spherical shaped local confined copper inclusions (analyzing spot 1). Further visible is a very thin corrosion layer which tends to separate from the surface (Figure 8a, b) and the energy-dispersive measurements in these areas (analyzing spots 3 and 4) showed high signals of Cu, Ag, O originating by the formed Cu/Ag-corrosion products with no detectable S. Noticeable is the fact that contrary to method 3 here fewer voids are formed at the interface, but larger in size and less uniform distributed. FIB SEM-EDX Analyses of Ag925 exposed to synthetic air, 90% RH and 500 ppb H2S for 24 h, followed by 90% RH and 500 ppb SO2 for another 48 h. a SEM SE image ×40,000of FIB cut cross section, b BSE image and EDX measuring point analyses of FIB cross section, ×20,000 (Images CEST, Wr.Neustadt). The samples treated by this method (showed a drastic change in gloss and colour within very short time periods (3 min). The gloss value of the samples relative to the original surface decreased within these 3 min by 92%. Figure 9 depicts the change in colour (ΔE) as a function of the exposure time. After this initial fast decrease in the first minutes of the tarnishing procedure, the colour change remains constant for a period of approximately 20 min and afterwards it increases again to constant values in the range of 47–50. The step function shows that the sulfidation process is not a continuous process. At around 20 min of exposure, there is a sudden change in colour. This suggests that the first initial products on the surfaces caused by the immersion process transformed in other products. Figure 10 shows a FIB cross sectioned sulfide layer for sterling silver exposed for 60 min to Na2S solution/air (method 5) corresponding to a final colour change value of approximately 47–50. Figure 10a shows a region where the bulk metal does not contain considerable Cu amounts. Nevertheless, the corresponding X-ray spectrum collected at arrow 1 shows the presence of both Cu and Ag. There the sulfide layer (arrow 1) had a thickness of about 0.15 µm. In the bulk large empty voids (arrow 2) and Cu-rich inclusions can be found (arrow 3). Other regions in the sulfide layer have considerable amounts of Cu- species and the shape of this layer is presented in Figure 10b. There, the sulfide layer had a thickness of about 0.6 µm and the collected X-ray spectrum at arrow 4 shows the dominant presence of Cu. The voids close and below the interface appear to contain products with irregular shape, possibly remnants of the copper inclusions. X-ray spectra taken at the surface of the sample after 60 min of sulfidation shows a very large increase of Cu concentration to 35.8 wt%, O 3.6 wt%, S 10.1 wt% and rest Ag 50.5 wt% (Table 2). The presence of Cu-rich compounds in the tarnish layer has to be considered as a main constituent. Backscattered electron images of a FIB cut of sterling silver sulfidized with the Na2S method for 60 min: a a surface area with moderate Cu content in the sulfide layer; b an area with a higher Cu-content in the sulfide layer. (Images CEST, Wr.Neustadt). The secondary electron images in Figure 11 illustrate how the sulfide morphology changes over time. In the early stage of the sulfidation process (3–9 min) the surface became irregular, explaining the sudden drop of gloss. As the sulfidation proceeded, the crystalline corrosion products increased in size. The crystals have a coarse compact and geometrical shape. SEM images of the evolution of the tarnish layer over time after 3 min (a), 9 min (b), 60 min (c) and 300 min (d). (Images CEST, Wr.Neustadt). The results of the FIB-cross section not only show that the thickness of the sulfide layer increases, it also became more heterogeneous (see the white spots in the sulfide layer in Figure 12d) and the amount of voids increased as well. The analyses suggest that when the sulfide layer is growing the adherence of the sulfide layer to the metal below is gradually lost. The main advantage of this corrosion procedure is that it is not only standardized, but also the corrosion conditions can easily be controlled, although the succession of surface states during the corrosion process must be considered in the production of artificially corroded dummies. Evolution of the tarnishing layer as function of time with SEM-FIB. The images correspond to the ones in Figure 11. (Images CEST, Wr.Neustadt). For the corrosion of sterling silver in ambient atmospheric conditions (method 1 and 2), the laboratory environment resulted in a much faster corrosion than for the residential environment. These corrosion processes are regarded to be too slow for the practical use of sulfidizing coupons to perform cleaning experiments. Short production times, controlled conditions and reproducible samples are important issues and therefore, artificial corrosion methods 3, 4 and 5 seem to be more convenient to produce sulfidized sterling silver coupons. However, the sulphidation environments for the 5 methods are completely different: (1) the TAA method 3 is governed by the acid gas H2S while the Na2S immersion method 5 occur in a strong alkaline solution of pH = 14, or (2) some methods occur in a gaseous environment other ones in a liquid environment. For the artificial corrosion methods 3, 4 and 5, the surface of the resulting sulfide layers appear with the naked eye very similar. However, at a microscopic level both surface and cross section show significant differences. The surface topography shows important differences between the different sulfidation environments with a needle-like structure for method 3 (Figure 6c), small grains on the surface (Figure 7a) and coarse grains, obscuring all surface features for method 5 (Figure 11d). The corrosion state is highly dependent on the exposure time. Also, the morphology and thicknesses of the formed corrosion surface layers formed by the method 3, 4 and 5 show significant differences in cross-section. This means that when corrosion conditions are not well controlled, dummies with a variation in corrosion states are obtained. In addition, the chemical composition of the corrosion layer differs between the methods used. As shown in method 1, 2 and 4, the corrosion process can involve a strong formation of oxides. The chemical composition of the corrosion layers also shows a substantial Cu enrichment. This means that cleaning evaluations should not be focused on Ag2S removal only. The cross-sections of the sulfidized samples demonstrated that the microstructure of the region just below the surface is more heterogeneous than expected. Within our studies we could clearly show that sterling silver samples treated by the accelerated tarnishing test methods 3 (TAA) and 5 (immersion method) show the formation of voids during the sulfidation process. It is known that copper is oxidized preferentially and oxidizes faster than silver. Therefore, the larger voids located in the vicinity of the interface (Figures 6, 10, 12) must be the result of a migration process (oxidation) of copper inclusions. These oxidized copper species diffuse towards the surface and react subsequently with the environment. The sulfide layer in the cross sectioned samples appear to be compact with a uniform thickness, suggesting that the corrosion products grow laterally over the surface. The residual gaps are in general not completely filled with bulk material or corrosion products within the monitored time frame although some solid material appeared to be present in these voids (see Figure 12). This shows that artificial corrosion procedures might affect the cleaning performances and evaluation. It is a common practice that new cleaning techniques are tested and evaluated on artificial corroded dummies. For pure silver, several corrosion procedures have been used because they all appear to produce Ag2S. However, for sterling silver the tested corrosion procedures seem to generate variations in morphologies, compositions and voids below the surface. Therefore, it is possible that the cleaning performance might be affected by the corrosion procedure used. Moreover, several indications suggest that the natural corrosion state of sterling silver cannot be considered as a single corrosion state but merely a set of corrosion states. The variation between artificial corrosion procedures and within natural corrosion processes complicates the representativity of the cleaning tests for genuine historical objects. Due to the complexity of the examined corrosion states of sterling silver in different sulfidation environments, there is no indication that the corrosion methods are identical. There were clearly differences between the corrosion methods used and between different exposure times of the same corrosion method. The most notable differences were: (1) the difference in morphology of the sulfide layer, (2) the absence or presence of sulfur in the tarnish layer, and (3) the presence or absence of voids. From a conservation-restoration point of view, the results indicate that cleaning experiments on artificially sulfidized sterling silver coupons is indicative for historical results but should not be directly extrapolated to historical objects. For that reason, cleaning experiments on artificially sulfidized sterling silver coupons can be expected to be different in regard to genuine historical objects. The introduction of new cleaning methods (e.g. cold atmospheric plasma cleaning) goes along with a continuous learning process and gradual gain in experience where the complexity of dummies and genuine objects is increased step by step. Precise measurements of the silver objects surface are necessary to identify elements and corrosion products prior to treatment, especially for the use of non- or low-invasive cleaning techniques, in order to increase the chances of attaining a predetermined target of treatment result. However, as shown in this article, surface measuring techniques (e.g. UV–Vis, SEM-EDX) are not always capable of revealing all of the relevant aspects that might influence the cleaning performance, such as voids or intermediate layers. To reveal the latter, cross sections should be taken. Moreover, the presence of metastable corrosion states and the presence of voids suggest that the corrosion process of sterling silver in insufficiently understood which also may hamper cleaning test evaluations. PS: Acquisition and interpretation of data, drafting the manuscript, accountable for all aspects of the work. OS: Acquisition of data, analysis and interpretation of data, drafting the manuscript and revising it critically, accountable for all aspects of the work. RW: Acquisition of data, analysis and interpretation of data, drafting the manuscript and revising it critically. All authors read and approved the final manuscript. The authors are grateful to the EU-project PANNA (FP7, no 282998) for funding, The Centre for Electrochemical Surface Technology CEST for the use of instrumentation and The Institute of Science and Technology in Art of the Academy of Fine Arts Vienna for the cooperation. More in particular, we thank the following persons: Christoph Kleber, Centre for Electrochemical Surface Technology, Viktor-Kaplan-Strasse 2, 2700 Wr. Neustadt, Austria; for the acquisition of data, analysis and interpretation of data. Manfred Schreiner, Institute of Science and Technology in Art, Academy of Fine Arts Vienna, Schillerplatz 3, 1010 Vienna, Austria; Supervision of a contributing research group. Joost Caen, University of Antwerp, Conservation Studies, Blindestraat 9, B-2000 Antwerp, Belgium; Supervision of the contributing Heritage & Sustainability research group. Karolien De Wael and Gert Nuyts. University of Antwerp, Chemistry Department, Groenenborgerlaan 171, 2020 Antwerp, Belgium; Supervision of the contributing AXES research group for SEM-EDX measurements.